Aveda lead stylist Antoinette Beenders created "Model Off Duty hair" using Aveda Pure Abundance Hair Potion and Aveda Control Force Firm Hold Hair Spray at the ORGANIC by John Patrick Fall/Winter 2011 Fashion Week presentation. 1. Sprinkle Aveda Pure Abundance Hair Potion throughout the hair for matte texture. Massage with fingertips at the root for slight volume. 2. Gently backcomb hair at the crown, using a wide-tooth comb to create a textured, ultra roughed-up look, while leaving the ends of the hair untouched. Spray with Aveda Air Control Hair Spray for light hold. 3. Using a Mason Pearson brush, loosely brush the top of the hair back to smooth backcombed portions. Allow hair to part naturally. 4. To create the textured, half-up style, twist and pull one-inch sections from above the ear on each side of the head. Use bobby pins to secure the entwined pieces at the occipital bone at the back of the head. 5. 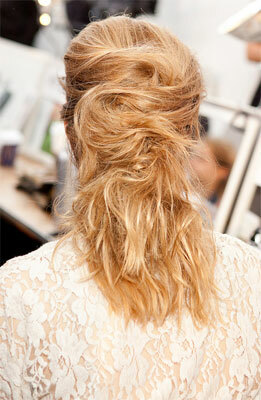 To keep the haphazard look from being untidy, finish with a holding mist of Aveda Control Force Firm Hold Hair Spray. Question: What was your inspiration for this look? How did you collaborate with the designer to create the look? Antoinette Beenders: John Patrick and I were inspired by the idea of a girl quickly pulling her hair back and pinning it. The concept of reflection inspired the collection, and we loved the idea of a woman sitting down at the mirror to create a realistic and unique hair style for herself. This season's ORGANIC collection is elegantly devil-may-care, so the perfect nonchalance of the hair complements this aesthetic perfectly. Question: How could a woman achieve this look on her own? Antoinette Beenders: This look is all about unstudied style, so it's easy to recreate. Prep with Aveda Pure Abundance Hair Potion to create tousled texture and backcomb hair at the crown with a wide-tooth comb. Spray with Aveda Air Control Hair Spray for light hold and randomly pull side sections of hair back, pinning erratically, just above the nape of the neck. Finish with Aveda Control Force Firm Hold Hair Spray and you'll be set for the day.